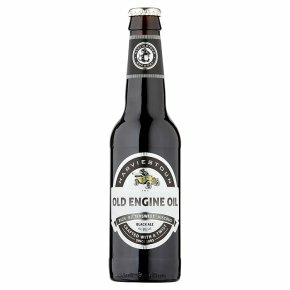 First brewed in 2000, Old Engine Oil is, according to head brewer Stuart, it's great for drinking as well as cooking. It's smooth and creamy with flavours of coffee, buttered toffee and dark chocolate. A touch of sweetness rounds off a cracking beer. Rich, bittersweet, viscous. Crafted with a twist. Winner of a gold medal at the international beer challenge 2013.Legend has it that Old Engine Oil was dedicated to our Head Brewer's love of classic cars. But it's the thick, dark, chocolatey viscosity that reveals the real inspiration behind the name. We use loads of roasted malt to give it a rich black colour and plenty of oats to give it a wonderful, velvety mouthfeel. It's just the job for anyone who appreciates beautifully engineered stuff that used to be made properly. So undo the top button of your pressed pit overalls, ease into the wingback and roll out a rare taste of a truly great British beer. Welcome to our Owners' Club. Best served chilled at 8°c.